I just want to share this with everyone! I am so excited! One of my photos was selected by Fro as the photo of the Day. Jared Polin, photographer extraordinaire, has an amazing business, website, and social media presence. He is from right here, in Richboro, Pa! He has a following of over 50,000 people on Facebook and I have been a fan for a long time. Every once in a while, I will upload one of my photos to his Flickr group for consideration as photo of the day. 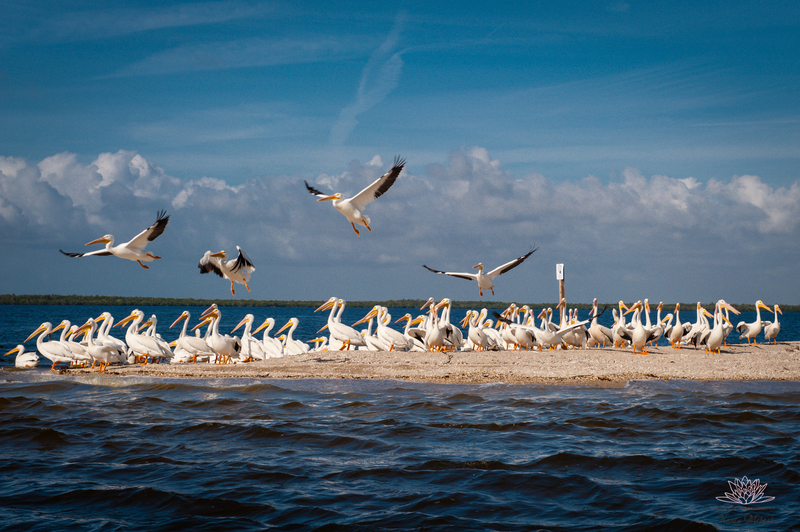 To my surprise, my photo of the white pelicans in Cape Coral, Florida was selected. My sister, Pam and George took me on a boat ride and George turned around for me to get this shot. He kept easing the boat closer and closer to the birds until they all started to take off. I was happy with the shot – of course, it would be hard to get a bad shot with so much beauty everywhere. Fro Knows Photo Dot Com! I love the way you use your skill Nancy! Well deserving shot! Love this image! Congrats, Nancy! !